"University training must be responsive to the challenges and needs of the country, the region and humanity. The training should be relevant and of the highest quality" says Prof. Stanley Waudo MKU Vice-Chancellor. Prof. Waudo explains, MKU has continued to integrate effective quality assurance and control mechanisms in its operations. The university has in place systems that ensure the expectations of students and of other stakeholders are effectively met. For example, MKU’s ISO certified quality management system (QMS) ensures that the teaching and learning environment, and processes, are effectively managed to widely accepted global standards. “It is out of this commitment that we ensure we are in good books with the regulator, the Commission for University Education (CUE),” the VC stresses. “Last September, the university transitioned from the ISO 9001:2008 QMS to the revised standard – ISO 9001:2015 QMS. The university first obtained ISO certification on December 19, 2012,” he adds. Prof. Waudo explains that transitioning from ISO 9001:2008 to ISO 9001:2015 certification was not a walk in the park for the university. It was a time-consuming yet rewarding process. When the new standard was published, the university had to bring together all internal stakeholders to develop a work plan detailing the journey to certification. “We had benefitted immensely from ISO 9001:2008. So, it was natural that we transition to the upgraded standard,” Prof. Waudo says. “ISO 9001:2015 is a quality management tool that enhances efficiency in operations,” he adds. The scope of MKU’s quality management system is broad, covering all its campuses and centres. MKU has also amended its Service Charter and improved the framework for development and evaluation of performance contracts. The university has robust internal quality assurance mechanisms that ensure its graduates have the desired knowledge, skills, creative abilities and moral qualities. 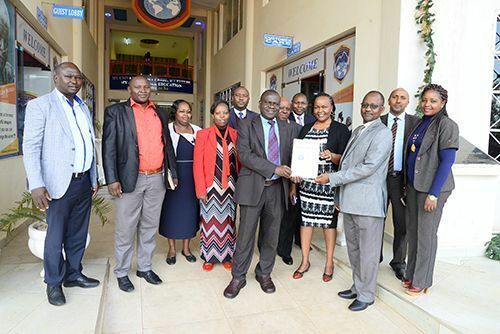 Hence, various professional bodies have accredited MKU programmes, an assurance that the university is walking the narrow path of sticking to guidelines that guarantee quality. Prof Waudo points out that accreditation certifies quality and relevance of academic programmes. It also certifies compliance of the institution offering the academic programmes with the set training standards and regulations. The focus of accreditation is on quality of institutional teaching facilities, governance, human resource, programmes teaching and learning processes, examination and certification processes, among others. Early last year, the MKU Bachelor of Science in Nursing programme was re-accredited by the Nursing Council of Kenya (NCK). Mid last year, the Council of Legal Education (CLE) fully accredited the university’s Bachelor of Laws (LLB) programme. Then on October 25, CLE inspected MKU Parklands Law Campus in respect of the Diploma in Law Programme, and thereafter licensed the campus as a Legal Education Provider pursuant to the provisions of Legal Education Act and the relevant regulations. The Bachelor of Science in Environmental Health and Bachelor of Science in Real Estate Management programmes are being considered for accreditation by the Public Health Officers and Technicians Council (PHOTC), and the Institution of Surveyors of Kenya respectively. The university programmes are approved by CUE and respective programme regulatory bodies.